Next up in our wish list service reviews, we now include in our wishlist comparison table a wish list service from Sweden. The name of the service is Wishlistr. It is a dedicated wish list service that has been around since 2005. Let's see what they have. Let's start the review by first having a look at how the service works. After that, we will dive deeper and list all the functionality. 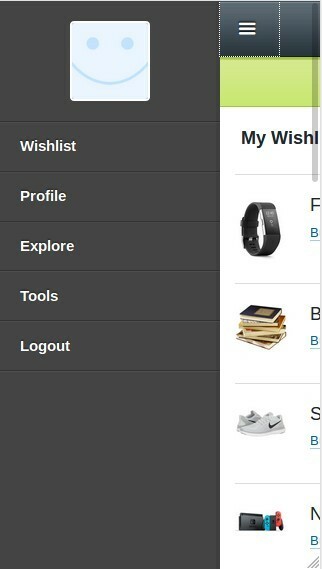 In this service, wish list creation is started by clicking the 'sign up' button on the front page. The button is not as visible as in many other services, but it is there in three places, so you won't miss it. On the sign in page, you will need to provide your name, pick a username, email address and password, and click once more the 'sign up' button at the bottom of the form. However, it seems that even the email address is not verified, so you can enter whatever you like, as long as you remember it. Then you login to the service with the information that you just gave, and you see your empty list. Click the 'add item' button and add what you want. Once your list is ready, there isn't an obvious way visible to share it. But with a bit of clicking around, you will find it in the menu (tools | share & invite), or by checking the email you received from the service (in case you gave a valid email address). They don't have ads in the service, which is great. This was verified by clicking through their service and by reading the FAQ. However, they do utilize affiliate networks extensively, which is not so great for privacy. The affiliate links were quite annoying with my browser setup (ghostery extension), as I needed to click a few times more to even see the product details. See more in the attached video. The service is a dedicated wish list service. They don't have an actual mobile app, but the web pages will scale nicely to smaller screens, as you can see from the attached screenshots. Wishes can be added from anywhere. They provide a bookmarklet and buttons to link to your own list from outside the service. There is also a widget that can be used to embed a wishlist on another website. Lists can be shared through the tools section to Facebook and/or Twitter, in addition to just emailing the link out. You can login to the service with email address or with some open-id and/or Oauth providers, including Facebook, Twitter and Yahoo. So, multiple login options are available. From that, we can say that the 'surprise me' functionality exists, in case the user remembers to not use his own list url when accessing the list. This makes me feel that the tracking and 'surprise me' functionality are done with the absolutely lowest effort. I will give the check marks, but reluctantly. The service doesn't support group purchases in any way. It is also only available in one language (English). The GUI is modern in the way that it scales well to different screen sizes. Otherwise, it has a bit strange, mixed layout and it has not been updated in years. But a check mark for that, too. 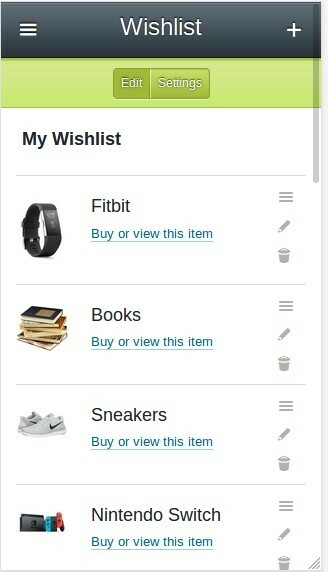 I didn't notice any extra functionality on the service, except that you could also import a wish list from Amazon's wishlist, or from the past del.icio.us service. I didn't count that as such a significant feature that it should be listed. 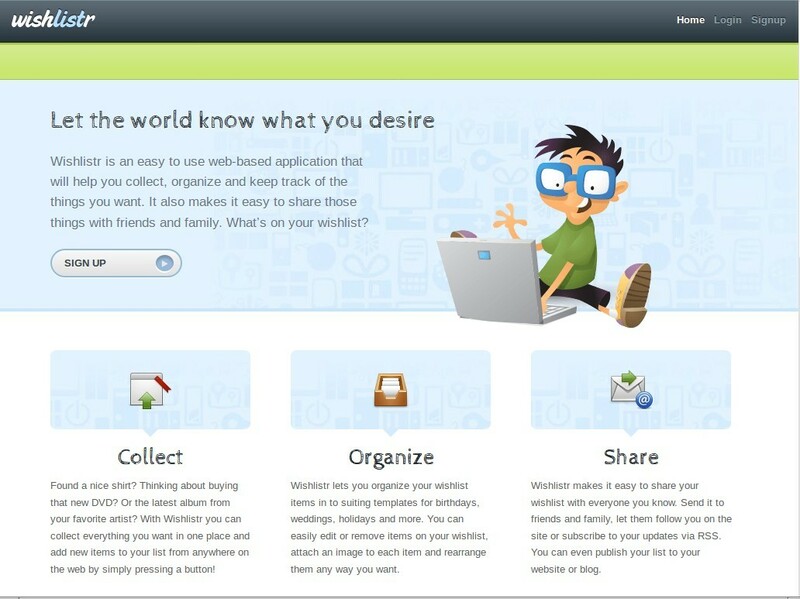 Rather, they should remove the del.icio.us part, as it was closed almost 2 years ago. Are there any other features that I didn't get? If there are, please let me know so that I can update the review and the comparison table.